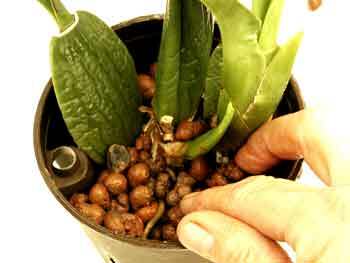 Repotting oncidium orchids into our hydroponic system can bring dramatic results. Oncidiums have a relativley delicate root system. Misjudge watering requirements and the roots will decay quickly. 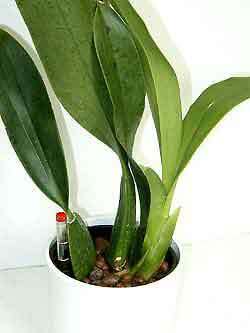 Our hydroponic system is a big help for growing oncidiums because a water gauge makes accurate watering is easy. 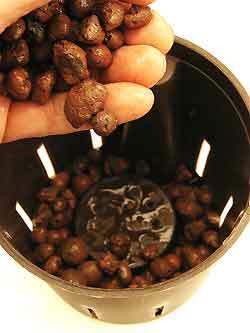 LECA pebbles replace all other potting materials. 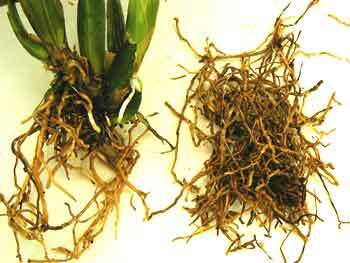 They won't deteriorate so root rot is never a problem. And the spaces between the pebbles promote maximum air flow around the roots. Oncidium is a large and diverse family of plants. Some look similar; others look radically different. The good news is - they're all are comfortable with Hydroponics. 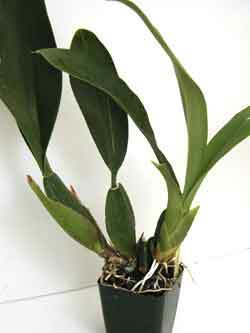 Here's a healthy oncidium orchid looking for a new (and bigger) grow pot. Perfect choice to illustrate repotting oncidiums into hydroponics. 1. We always start by rinsing LECA pebbles with clear water to wash away the dust from shipping. 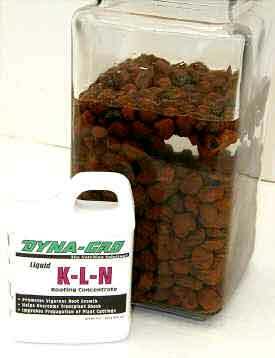 Then soak pebbles overnight in a solution of 2-3 TBS of K-L-N Rooting Solution per gallon of water. 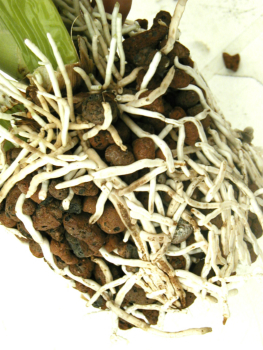 KLN promotes new root growth while resisting disease. Save soaking solution for watering new transplant later. 2. Remove grow pot and inspect the roots. As you can see, this plant has lots of healthy roots. 3. 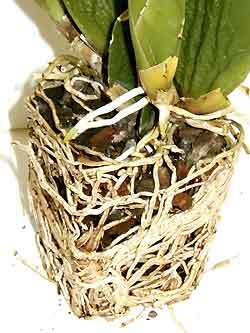 Untangeling roots and removing old potting media can be a project with mature Oncidiums like this one. Chop sticks are the perfect tool for removing imbedded bark chips. Remember, remove everything! 4. 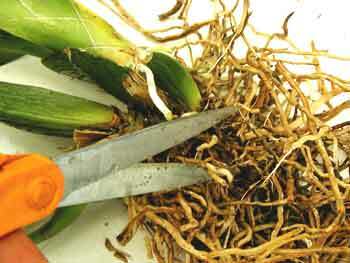 Cut away any rotting or discolored roots. Be aggressive here! Plant will grow new roots quickly. 5. We often remove most of the existing roots. Roots on right have been cut away and will be discarded. The future for this plant is the white roots growing at the base. 6. For this plant, we're choosing a culture pot on size larger than the old pot. Fill bottom of new culture pot with pebbles from KLN soaking solution. Fill pot just enough to cover dome on bottom. 7. Postion plant toward the back of the culture pot with new growth facing front (notice new growth tip in the center). This gives the plant plenty of room for new growth to mature. Add more pebbles. Tap down pebbles to eliminate air gaps. 8. Insert Water Gauge into culture pot and set plant in Outer Pot. There's a good looking plant! Congradulations! 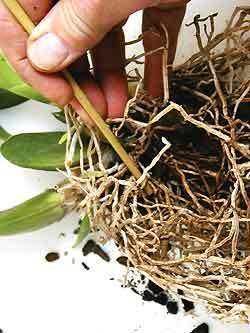 You've just repotted your oncidium orchid into it's new home.